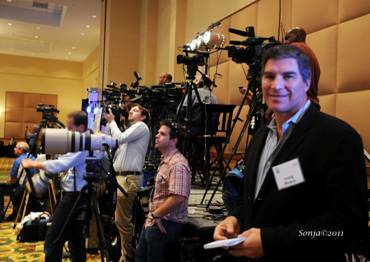 Bloggers from throughout Texas were invited to attend the Cain-Gingrich Debate held on November 5 at The Woodlands Resort and Conference Center, The Woodlands, Texas. 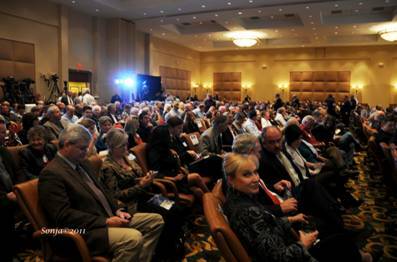 The Conference Center was filled almost to capacity with approximately 1,000 people attending the fundraiser. Those sitting in the front seats paid a premium of $1,000 and entitled them to attend a party after the debate where they could mingle and be photographed with the two candidates. The debate centered on entitlements and the questions were limited to Social Security, Medicare and Medicaid. Maybe I had expected more than the debaters were capable of giving, or maybe I had expected that Newt Gingrich would overpower Herman Cain. The debate was, to say the least, a disappointment. This debate was a sharp contrast to the previous debates, in time and manner. The length of time from one minute answers to 90 minutes for two candidates similar to the Lincoln-Douglas style debate enabled the audience to really see the differences or the sameness in their policies. Cain gave his best poor performance retreating to his one liner answers, “That’s their boogie woogie” and his ability to talk his way through a situation and revealing his lack of knowledge. Gingrich took full advantage of the time and gave long winded answers with really very little punch. The syrupy friendly debate was almost too much to bear. Their agreeing on the issues and complimentary rhetoric towards each other was definitely not real but pure plastic. I spoke to one of Gingrich’s aides after the debate and told him about the syrupy performance and he agreed. It was something that was expected. During the course of the debate on Medicare, when Cain was given the question to define ‘benefit plan’ or ‘premium support’ by the moderator, he told Gingrich, “You go first.” It really makes no difference if the audience knows what benefit plan or premium support means, what is important is that the debaters know what the moderator means. This is a big clue that Cain is not up to taking residence at 1600 Pennsylvania Avenue. Gingrich’s answer centered on explaining that mandate does not work (ObamaCare) and discussed the fallacy that Obama says that PSA testing on men is not necessary. Cain and Gingrich echoed Rick Perry’s plans on Loser Pay Laws and Social Security. I was surprised that Cain would actually discuss the Loser Pay Law knowing that the audience was comprised of Texans. The Loser Pay Bill, HR 274, became law in Texas on September 1 of this year. Governor Rick Perry has not only been a great proponent on this issue but understands that tort reform is necessary to bring jobs to Texas, and if he is president, will introduce this law to America. Cain said with authority and arrogance, “I spoke to a group of doctors just a couple of days ago. 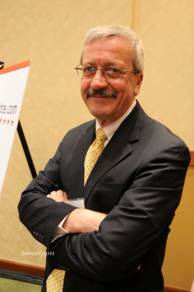 Loser pay laws, whether they pass state level or federal level, losers pay because that’s what is driving up the cost of malpractice insurance that’s what causing doctors to practice defensive medicine and loser pay laws would be a big step towards overall tort reform.” The audience either uninformed or polite applauded his ‘idea’. Cain must not have known that Texas already has this law or the moderator, Ben Streusand, Chairman of the Texas Advisory Board of Americans for Prosperity, thought Texans should hear this magnificent revelation coming from Cain. On Social Security reform, Cain and Gingrich regurgitated Perry’s plan. Gingrich rehashed what Perry previously had advocated that the seniors already receiving Social Security would not be affected. The young people would have options of different individual retirement plans. Why would a supposedly intelligent man such as Gingrich retell Perry’s story on Social Security? Gingrich received whistle calls after repeating, “Why should congress tell you, you can’t, so let’s get politicians out of that decision process and return it to Americans and let Americans control their own lives.” Didn’t Perry say get Washington DC out of our business? The Ryan’s Medicaid block-granting plan was a major part of the discussion on Medicaid. They each agreed it was a good plan. Cain repeated what most candidates are saying and working Americans want, “We have to go from an entitlement society to an empowerment society.” Gingrich wants to give each state the right to decide on entitlement programs by moving back to the 10th amendment. Didn’t Perry say, "These resolutions boldly affirm the rights reserved to the states by the 10th Amendment to the U.S. Constitution, a vital issue that affects the livelihood of all Texans and Americans." On immigration, Gingrich used UPS as an example. Send all illegals a package because UPS knows how to track a package. We should know who is receiving our services, he said. Gingrich declared that each state should sue the federal government for services provided to illegals in their state. Perry did sue the federal government for the time we housed illegals in Texas ordered by the Obama administration. We needed to hear what these two presidential candidates had to say. Governor Rick Perry has supported competition for some time now in insurance and in job creation between states. Cain and Gingrich want to do what Perry has already implemented in Texas and plans to do for America if elected as our president. It would be great to have Governor Rick Perry debate in this Lincoln-Douglas format so that we would have an opportunity to learn what he has in mind for America. 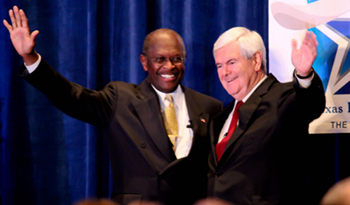 As far as I am concerned Cain and Gingrich came to Texas to discuss Governor Rick Perry’s policies and if the audience did not get that, then where have they been!